GIMP Forums / GIMP / Beginners / Versions&Setups? I am confused about Windows GIMP versions and setup files for the specific release. I was looking for older GIMP versions so thru gimp.org I've found the folder with 2.6 setup files where there are releases from 2.6.0 to 2.6.12 marked as the latest 2.6.x release. So - could someone, please, explain me the differences between the different setup versions of the same release and the reason how could version 2.6.9&2.6.10 file sizes be more than twice version 2.68 and then version 2.6.11 again the half size of v2.6.10? And which is the latest 2.6.x release. BTW, the editor didn't work so I had to insert the formatting code by myself. The sizes generally get larger with each revision, although you might get a minor revision where the code has been optimised resulting in a smaller installation package or it might be that the compression of the installer is a bit more. (Sep 6, 2014 12:50)rich2005 Wrote: The sizes generally get larger with each revision, although you might get a minor revision where the code has been optimised resulting in a smaller installation package or it might be that the compression of the installer is a bit more. You mean this listing? And what about the other one where there are huge file size differences in 2.6.9 and 2.6.10? BTW, how did you read out the exact file sizes? Quote: You mean this listing? And what about the other one where there are huge file size differences in 2.6.9 and 2.6.10? click on the last modified at the top of the /pub/gimp/v2.6/windows page to sort by date. I meant how did you read out the file sizes up to 2 decimal places from this listing. Because the values are rounded up to the whole MB and even when I click on the links I can see the filesize only up to the one decimal place (without starting the download). So that's it. Now it is clear, thanks for the help! Quote: ..I meant how did you read out the file sizes up to 2 decimal places from this listing. Because the values are rounded up to the whole MB and even when I click on the links I can see the filesize only up to the one decimal place (without starting the download). 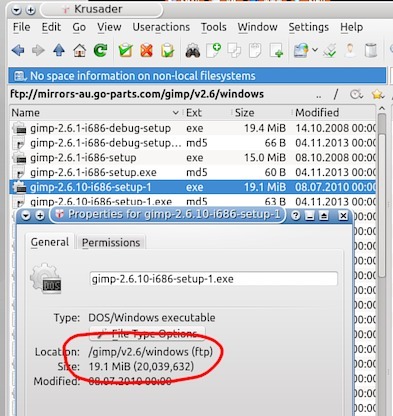 there are some FTP mirrors there so get a windows FTP client and try that. Than you very much for your help!